At the beginning of every year, retailers rethink their strategies in response to the latest trends and technologies. Since so much can change from one year to the next, it’s important to sit down annually and formulate new goals. In 2016, online sales will continue to become an increasing part of any business’s growth strategy. But how does a retailer win customer dollars away from competitors? Here are a few key elements every retailer should have in its strategy for 2016. Millennials have embraced mobile more than the previous generations, relying heavily on their smartphones for everything they do. 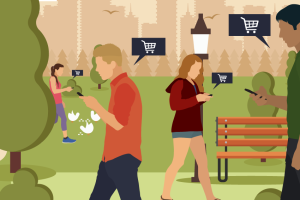 Retailers, interested in reaching out to this desirable demographic, are now faced with finding ways to make sure that when these shoppers engage in showrooming, they ultimately choose to buy from them. Savvy millennial shoppers won’t merely rely on mobile searches to make a decision once they’ve arrived at the store, they’ll actually use technology like price comparison tools and price drop alerts to make sure they get the best possible deal on the product they’re considering purchasing. Across all generations, mobile is here to stay. In fact, mobile now accounts for more than half of all Internet traffic. While some customers still shop on laptop and desktop computers, even more are browsing retailers’ sites using tablets and smartphones. This means that retailers must ensure their strategies include mobile engagement, from the information they provide on their websites to the shopping experience itself. To remain competitive, a store has to meet the challenge of making purchasing on small mobile screens customer friendly. retargeted ads, and even social media and push notifications via texts apps. Retailers will rely more heavily on analytics and personalization in 2016, making it a must for retailers of all sizes. With each year, technology seems to become a more integral part of a workable strategy. For retailers, this means using the tools available to learn more about customers. But as quickly as that information is gathered, businesses should also be putting it to work for them. When combined with price-comparison software like PriceManager, retailers will find they’re earning new customers, as well as maintaining the ones they already have.